There are two stages of nightlife in Rome: early and late. The first part of the evening always kicks off with aperitivo, Italy’s answer to happy hour. Considering that dinner rarely starts before 8 p.m. at the earliest, aperitivo is the perfect way to unwind with a cocktail and some earlier snacks, though some neighborhood spots even offer a full buffet starting around 6 p.m. Clubs and bars fall into the latter (or later) category of Roman nightlife. Considering that dinner is always after 8 p.m., these hotspots don’t really kick off until midnight, and you are going to be pretty lonely if you show up before 11 p.m. In terms of the coolest areas to go out at night in Rome, the best dance clubs can be found slightly outside of the center, in neighborhoods like Ostiense and San Giovanni. Testaccio was also once known for its nightclubs dug into the side of Monte Testaccio, but these have declined in popularity in recent years. Other areas, like Pigneto and San Lorenzo, are known for their large student populations, cheap beers, and outdoor crowds who take to pub-hopping on Friday and Saturday nights. In the summer months, white tents line the river banks along the river near Tiber Island. These outdoor bars and restaurants are most popular for a few drinks at sunset but stay open until the early hours of the morning. Just remember: while there are very rarely any enforced dress codes, Romans tend to dress to impress. Keeping a step above casual is always a good idea when it comes to enjoying Rome’s varied nightlife scene. And don't worry if you end up burning the midnight oil – there will be plenty of espresso available to keep you going the next day. Rome’s most famous speakeasy has been lauded as one of the top bars in the world thanks to its dedication to mixology. If you want to taste their one-of-a-kind concoctions, you first need to make a reservation, then check the website for the daily password before you arrive. Inside, the tiny bar is filled with Rome’s cool crowd, dressed in black and smoking while sipping on the cocktails made with the bar’s own bitters and specially imported liquors from all over the world. With space for more than 700 partiers, Goa is one of Rome’s most popular nightclubs. The club is located in Ostiense, an urban area just outside the center of Rome that is known for its street art and (increasingly) its nightlife options. The techno club regularly books international DJs for its buzzing Thursday, Friday, and Saturday night lineups. Once you have danced away, sink into one of the couches in the bar lounge area for one last drink. Serious beer drinkers don’t have to look any further than this tiny pub on small street behind Piazza Trilussa in Trastevere. The craft beer scene has grown significantly in Rome in recent years but Ma Che Siete Venuti a Fa (which translates to “but what did you come here to do?”) was one of the first and remains one of the very best. The laid-back bar staff and patrons are here to drink hard-to-find artisan brews from Italy and Europe and enjoy the relaxed atmosphere where most customers end up chatting outside with a pint in hand when the narrow bar gets too full. 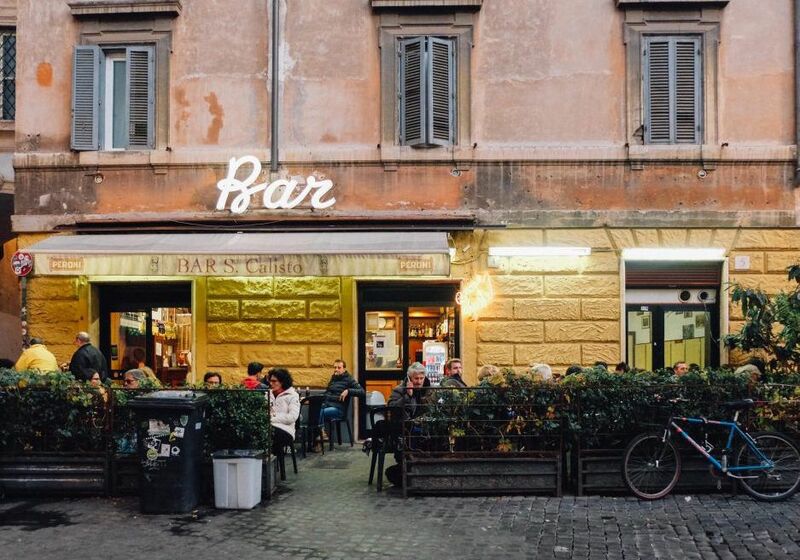 This bar a few minutes from Piazza Navona is a staple on the Roman nightlife scene, but it actually stays busy from early morning. A coffee bar with chess players by day, the crowds gets younger by the time aperitivo rolls around. Pay for your drink first, and then take the receipt to the barman to watch your cocktail being created with a little bit of flair. The bar’s most popular feature, however, is its outdoor patio that fills with a bigger and bigger crowd the later the night gets. This cozy cocktail bar and occasional music venue fits in perfectly with the Monti neighborhood’s overall bohemian vibe. Stuffed with a mish-mash of vintage furniture, Blackmarket is made up of a warren of small rooms that are perfect for everything from people-watching to privacy, depending on your mood. The intimate setting is dark and filled with art, adding to the low-key, romantic ambiance. The 1980s live on at this thoroughly modern hotspot in Monti. The neon lights and Blade Runner-esque decor may be throwbacks but the cocktail bar’s drinks are truly futuristic. Drink Kong is the newest venture from Patrick Pistolesi, one of Rome’s most famous bartenders, and the carefully crafted cocktails are the star of the show. To round out your night, stop in when there’s live music or come in any day for the tasty small plates of international tapas-style food. Located in the heart of Trastevere, Live Alcazar is a music venue and club set inside of an old movie theater. The bar has a regularly changing lineup of touring musicians, most of whom play jazz and funk, but there are also regular DJ nights for more of a dance club feel. The bar specializes in cocktails, and you can also reserve a table at the restaurant that overlooks the stage from the second floor. The crowd here tends to be slightly more subdued than the dance-lovers who flock to techno clubs further outside the city center, but the energy is still right for a good night out. Scholars Lounge was recently named the title Best Irish Pub in the World at the Irish Pubs Global Awards in Dublin. The lively bar is certainly Rome’s largest Irish pub and attracts a huge international crowd on weekend nights and when big games are being played. Filled with screens, this is Rome’s best sports bar, and they will put just about any international game on TV upon request. They also host weekly nights dedicated to trivia and karaoke and often have live music. The central location means this bar is popular and has slightly higher prices, but the pints are always served by charming Irish barmen. Pigneto, one of Rome's most popular neighborhoods for all-nighters, is best known for its cheap drinks and the lively crowd which gathers along the main drag to bar hop between pubs. However, one of the oldest bars in the formerly working-class area is still one of the best in the city. Necci dal 1924 is the kind of place to order an Americano to sip under the twinkling lights on the patio and has great evening energy, while at the same time having pockets where it is quiet enough to actually have a conversation with friends. This huge club between the Ostiense and Garbatella areas of Rome is one of the best stops for House and electronic music. With three different rooms, there is always a different sound (and a dancing crowd) ready to go. DJs like Skrillex have performed at Circolo degli Illuminati, but even when there is no international headliner, Saturday night is always a good time. What is Rome without wine? Cocktails are usually the drink of choice for Romans on a true night out, but quieter evenings call for the perfect bottle of Italian wine inside Rome's sweetest wine bar. Il Goccetto gives over most of its bar space to its extensive selection of wine, but there are a few tables to be had among the stacks of bottles. It is no great tragedy if there are no seats available because the best thing to do is to take your glass outside to sip while watching the Vespas zip by along the tiny cobblestone street just outside the door. Set atop Palazzo Fendi, where the Italian luxury brand has its flagship store, Zuma is nothing if not chic. The Japanese-inspired bar serves signature cocktails, as well as Italian wines by the glass, plus small nibbles like edamame or crispy calamari. Not only is the bar above the Fendi store, but it is also set in the very heart of Rome's most fashionable district, so the customers tend to look like they may have just stepped off a runway. The cozy lounge inside is perfect for a few drinks, but the bar is best in summer when the cocktails are served on the rooftop terrace overlooking Via Condotti, Rome's best shopping street. Coho is where the young and beautiful of Rome come to see and be seen. The trendy space is designed to look like your most fashionable friend’s uptown loft and is filled with couches overlooking the cityscape below. But it’s not all lounging and preening, there is also another floor for dancing and an extensive drink list to suit any taste.